Dr. Steve Larter holds the University of Calgary’s Canada Research Chair in Petroleum Geology and has more than 30 years’ research experience in petroleum geology and geochemistry in both academia and industry. Dr. Larter was named as one of the Top 10 Geologists in the U.K.in 2003, and has received numerous awards for his scientific contributions, including the Friendship Medal of the Peoples Republic of China. When he speaks, the smart people pay attention. Dr. Larter was the keynote speaker June 17 for the 2010 Goldschmidt Conference hosted by the University of Tennessee, Knoxville, and Oak Ridge National Laboratory. In his presentation, “Can Studies of Petroleum Biodegradation Help Fossil Fuel Carbon Management,” Larter discussed microbes in the environment and their role in breaking down oil and generating natural gas. This is with an eye to the feasibility of recovering hydrogen, instead of oil, directly from oilfields undergoing natural biodegradation processes. 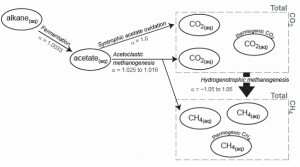 Larter is also examining the feasibility of using a related process, biologically assisted carbon capture and conversion of CO² to methane or natural gas via H² + CO² methanogenesis in the hydrogen-rich environments of weathering subsurface ultrabasic rocks, as a route to recycle carbon dioxide in flue gases back to methane. In Situ CH4 Production Process Diagram. Click image for more info. But the most interesting is the in field conversion of oil to natural gas. If Larter can develop the idea into a working process much of the oil in place, or about 4 times the oil already pumped and used could be available in the form of natural gas. It’s an astonishing concept. Over two years ago Dr. Larter showed how crude oil in some oil deposits around the world — including in Alberta’s oil sands — are naturally broken down by microbes in the reservoir. Larter is working on understanding how crude oil biodegrades into methane, or natural gas, opening the door to being able to recover the clean-burning methane directly from deeply buried, or in situ, oil sands deposits. Currently a problem exists out of the media and public’s view – biodegradation of crude oil into heavy oil in petroleum reservoirs is a problem worldwide for the petroleum industry. The natural process is caused by bacteria that consume the oil, making the oil viscous, or thick, and contaminates it with pollutants such as sulfur. This makes recovering and refining heavy oil difficult and costly. People don’t realize they’re competing with microbes for the oil. Using a combination of microbiological studies, laboratory experiments and oilfield case studies, the University of Calgary team demonstrated the anaerobic degradation of hydrocarbons to produce methane. The findings offer the potential of ‘feeding’ the microbes and rapidly accelerating the breaking down of the oil into methane. Larter is now working on an approach of capturing carbon dioxide and pumping it and special bacteria underground into alkaline rock formations where the carbon dioxide, a greenhouse gas, will be converted into natural gas. Larter says the petroleum industry already has expressed interest in trying to accelerate biodegradation in a reservoir. The business end has already started with Dr. Larter involved with Gushor, a Canadian consulting firm. Gushor is focusing on heavy oil recovery, fluid mobility, biodegradation, and carbon management emissions. The matter now is the sense of urgency. With ‘peak oil’ losing its public momentum, a great U.S. success from the Bakken formation in the Williston basin, a major oil well disaster in discovering a huge field in the Gulf of Mexico, and a series of discovery successes over the past two years around the world, the recovery techniques that Larter is proposing are getting pushed back into the less urgent category. That might not be the best idea. Petroleum hydrocarbons will be needed for centuries in declining amounts. Natural gas isn’t particularly good as a motor fuel, but would certainly be useful for light transport substitution. But for making heat whether for a home on to producing steam, natural gas is a very desirable product. The clean motive – less CO² also has a friend in natural gas. The single carbon atom in methane (CH4) with the four-atom hydrogen set makes for a lot of heat for a minimum of carbon reaction with oxygen. Methane also could have a big role in high efficiency fuel cells. Larter’s work is getting noticed and consideration. The move to commercial interest is underway. It’s an idea well worth having in the world’s fuel production arsenal. So Dr. Larter wants to convert one greenhouse gas (CO2) in to a far worse greenhouse gas (CH4)? Of course it’ll be fine as long as you can keep it out of the atmosphere, and “only” burn it, and methane oxidises to H2 and CO2 in a few years. However, recent events don’t exactly fill me with confidence that this kind of thing can be done safely. What will a massive CH4 blowout do to the earth’s climate? Many of them are rife with spelling issues and I to find it very troublesome to tell the truth then again I’ll definitely come again again. crude oil price will crash with 50% of vehicle turn to Electric. I think this is the best idea if crude oil can be convert to methane. methane have a lot of application than just burning it off. You can feed it to a gas reformer to produce methanol which can be used for electronic manufacturing. I am looking forward for an actual experiment with low pressure reservoir/almost depleted crude oil pocket.